In the middle of a conversation about playing baseball in Panama, Mariano Rivera reached into his locker at Yankee Stadium, rummaged around for an empty shoe box and removed the top from it. He held the cardboard against his left hand and showed me how a similar flimsy piece had been his first glove when he was a skinny seven-year-old boy. After Rivera was unanimously elected into the Baseball Hall of Fame on Tuesday night, I flashed back to the riveting conversation we had about his makeshift glove in 1996. I was transfixed by how he tore a hole in one end of the cardboard and poked his hand through it and happily used that as his glove. Somehow, a kid with a cardboard glove who said he never even dreamed of being a Major Leaguer developed into the greatest closer of all-time and a Hall of Famer. "I will never say I'm the best," Rivera once told me. "That's not something you will ever hear me say." But everyone can say it for him. Actually, we can shout it for him. There has never been a closer who was as dominant as Rivera, the silent assassin who essentially dominated hitters with one pitch: a cut fastball. It was an amazing pitch, a cutter with such incredible right-to-left movement that it bore inside on left-handed hitters and acted like a miniature chainsaw when it collided with their bats. Sometimes, the number of broken bats against Rivera's cutter would exceed the number of outs he collected. We all knew we were watching a Hall of Famer with Rivera, who holds the all-time record with 652 saves and also had a 2.21 earned run average, a strikeout-to-walk ratio of 4-to-1, a 1.00 WHIP and an ERA Plus of 205 (the league average is 100). For anyone who has tried to minimize Rivera's legacy by saying he's a closer who only pitched 1,238 2/3 innings, that's a foolish criticism that's not worth another sentence of attention. I covered Rivera's 19-year career and witnessed him collecting the final out in four of the five World Series that he helped the Yankees win. Dozens of teammates and opposing players spoke with reverence about Rivera and his impact, especially while going 8-1 with a 0.70 ERA and 42 saves in 141 innings in the postseason. Other closers disintegrated. Rivera rarely did, although he experienced some despair in the 2004 ALCS, the 2001 World Series and the 1997 ALDS. About an hour after the Yankees defeated the Mets to capture the 2000 World Series, David Justice, who had been acquired by the Yankees that summer, said, "If we had Rivera in Atlanta, we would have won about three or four World Series." Without Rivera lurking in the bullpen, the Braves won one. Select the best center fielder, the best third baseman or the best starting pitcher in history. OK, do you have your picks? While I'm not going to debate those choices with you now, I will make this assertion: Regardless of who you selected, I would argue that Rivera performed his job as well as any of those center fielders, third basemen and pitchers did theirs. He was as great as anyone else in baseball at simply doing his job, which was getting the final, precious outs of a game. "When he comes into the game, it's over," Derek Jeter often said. "That's always the way I feel." When the Yankees first scouted Rivera in 1989, he was a 155-pound shortstop who was gliding across a dusty infield in Panama. Herb Raybourn, who was the director of Latin American operations for the Yankees at the time, thought Rivera had good hands and a strong arm, but he didn't think Rivera could grow into a Major League shortstop. "So," Raybourn said, "I passed on him." One year later, Raybourn received a tip about a pitcher named Mariano Rivera. He was puzzled because he knew Mariano Rivera as a shortstop. But, in a decision that would have a seismic impact on Yankees history, Raybourn scheduled a workout for Rivera. Raybourn liked the fluidity of Rivera's arm and the movement on his pitches, so the scout signed Rivera for a $3,500 bonus. It proved to be one of the shrewdest signings and best bargains of all-time. Any time that I'm asked to name my favorite Yankees to interview, my answer is David Cone and Rivera. Cone is a pitching genius, which is why I collaborated on a book with him called "Full Count: The Education Of A Pitcher." Rivera is more of a teacher and a preacher, a man of faith who turned those interviews into memorable conversations. He was polite, he was elegant and he was spiritual, sharing wisdom about life and baseball. I enjoyed the life lessons as much as the baseball insight. I know Mariano wasn't thinking about Cooperstown, New York, while he was playing baseball on the beach for 340 days a year in Panama. Now it is his rightful home, his forever home. The Hall already has several artifacts from Rivera's fabulous career, from the cleats he wore during the 1999 World Series to the cap he wore in the 2000 World Series. But I think they should add one more item. 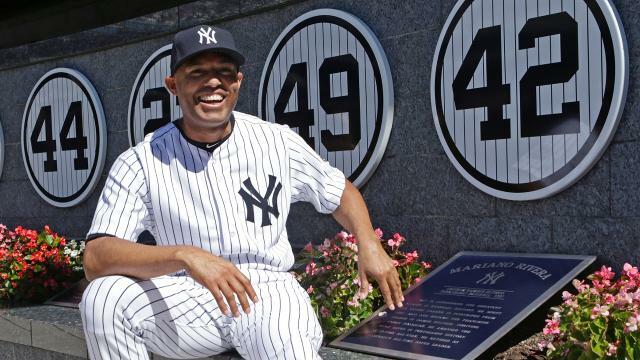 They should ask Mariano for a cardboard glove to symbolize where it all began.